When it comes to infusing your hair with moisture, sometimes natural really is the way to go. Coconut oil is one of the most popular moisturizers for hair and has found its way into a number of products, from treatment masks to detanglers. Rich in fatty acids, coconut oil is prized for its highly moisturizing properties for hair and body. It can be daunting when choosing the best product for your needs. Luckily, we’ve compiled a list of the top coconut oils, from the purest and most natural products to the most affordable and sweetly-scented formulas. Coconut oil can be used as a mask treatment, a detangler, a deep moisturizer and a leave-in conditioner for split ends. But first you need to choose the brand you’d love to repurchase again and again. From the wide range of options, we chose the most natural, affordable and reliable coconut oils for your hair. With nearly 14,000 reviews, Viva Naturals is an Amazon best-seller and a top-rated product. This may be the best coconut oil for hair. This oil is sustainably harvested only from mature coconuts from the volcanic regions of the Philippines. The coconuts are cold-pressed within a few hours of harvesting in order to preserve the MCTs (fatty acids) that make coconut oil so beneficial. Viva Naturals coconut oil is USDA certified organic, unrefined, and gluten-free. It works wonders on very dry hair and all hair types, including natural hair, can reap the benefits of this nutrient-rich oil. It’s also bleach and pesticide-free, so it’s sure to be gentle on hair. Overall impression: While this oil is all-natural, it does have a strong coconut scent that some users have noted smells musty after 25 minutes on hair. Viva Naturals coconut oil comes in a convenient plastic jar that is BPA-free, however, the lid is subject to cracking occasionally. Brand: Viva Naturals, as a brand, is fastidious about producing coconut oil only of the highest quality, using a 3-step approach outlined in the Viva Quality checklist. While the coconuts are harvested in the Philippines, Viva Naturals is based in Toronto, Ontario. They also offer an unconditional, 90-day money-back guarantee. An amazing offer for a natural product produced in small batches. Tips for using: Viva Naturals coconut oil has a 2-year shelf life, but chances are you’ll go through the product much faster than that. It works best as an overnight treatment to really nourish hair. Even if the oil is at a warmer temperature and in liquid form, rub it between your palms for 15 seconds to warm it up for greater penetration of the hair shaft. 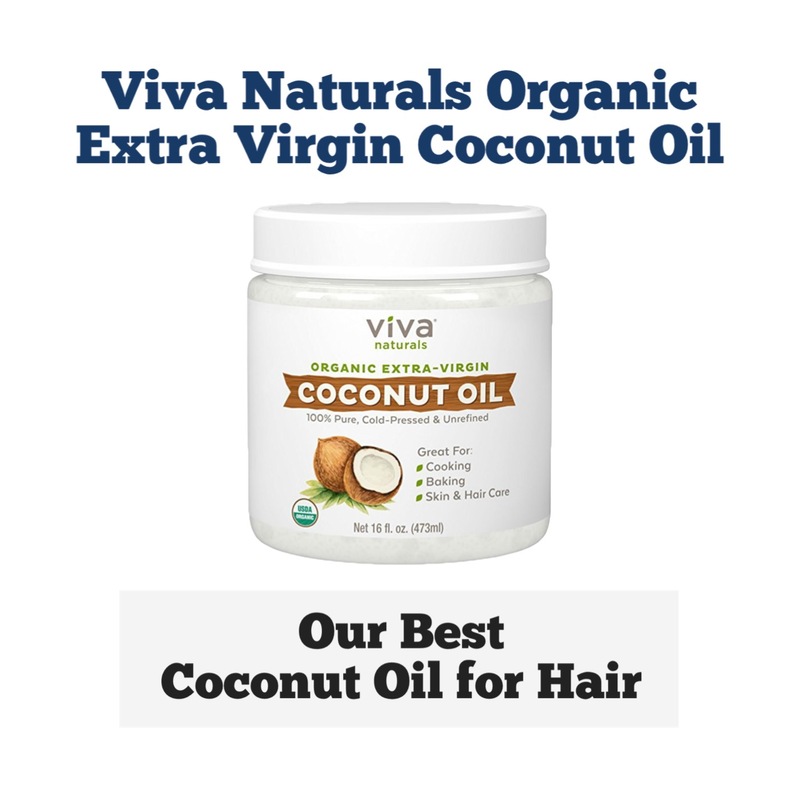 Viva Naturals coconut oil is one of the best natural, organic options for dry and damaged hair. Its high Amazon rating ensures that you will love this product. Unless you are highly sensitive to strong scents, the coconut aroma shouldn’t bother you. The company, in general, also has a strong approval rating. Nutiva virgin coconut oil is one of the best kinds of coconut oil on the list thanks to many of its healthy and clean properties. It may be one of the more expensive options on this list but comes from a company that is truly dedicated to a clean and pure lifestyle. This coconut oil is USDA certified organic, non-GMO, and kosher. The virgin coconuts used to make this cholesterol-free and non-hydrogenated oil are cold-pressed within two hours of being harvested. Nutiva coconut oil is great for all hair types but especially for sensitive scalps. Nothing in the coconut oil is irritating and so many users with sensitive skin have nothing but praise for this product. Overall impression: Most users of this oil love the light aroma, although some have complained of a rancid smell, which is most likely from a rare, bad batch. Fortunately, the company offers a solid, 30-day money-back guarantee or replacement of the product at no charge. This oil comes in a white, BPA-free, HDPE plastic jar that is coated and great at keeping light out that may potentially alter the oil’s chemical properties. Brand: Nutiva, as a company, is committed to a more conscious lifestyle and gives 1% of sales to groups that promote sustainable agriculture. This USA-based company was founded in 1999 by the same man that started the modern home-composting movement of the early ’90s. Tips for using: To use Nutiva as a hair treatment, warm the product by setting the package in some hot water. Leave it on for approximately 2 hours then wash hair as usual. One user noticed how much frothier her regular shampoo got and that her hair seemed much cleaner and easier to comb through. While Nutiva is relatively more expensive than others on this list, it may be one of the cleanest. Not only is it very pure, it is effective even for the most sensitive skin. Fractionated coconut oil contains a vastly different fatty acid composition than its unfractionated coconut oil counterparts making it rich in saturated fats and highly stable. Because Radha’s fractionated oil has been processed, it’s not technically a real coconut for hair, but it works wonders for hair growth and delivers the properties necessary for healthy hair. You can buy regular unrefined coconut oil, but Radha’s product is free of fillers, in liquid form, odorless, colorless, and non-greasy. It’s fractionated nature makes it more stable with a longer shelf-life. Radha coconut oil is great for someone looking for a carrier oil for their hair treatments. This coconut oil brand may be the best coconut oil moisturizer available due to its ability to mix well with other oils for full moisturizing benefits. If you don’t use coconut oil often, this product’s longer shelf-life makes it a good option. Overall impression: If you’re looking for a great-smelling oil, Radha isn’t for you as it’s odorless. It does, however, come in an easy-to-use pump bottle and is always in liquid form, saving you the trouble of dealing with solid coconut oil for hair. Brand: Radha is a New Jersey-based company committed to using the purest of ingredients in all of their products. Though relatively new since their start in 2014, the company has risen quickly due to its high-quality products. Tips for using: Because of its fractionated nature, Radha coconut oil is excellent as a carrier oil and works wonders when mixed with other moisturizing products like argan oil for a deep treatment. Radha is the most unique on this list and works great when mixed with other oils or coconut conditioners. The pump bottle is easy-to-use, and the odorless nature may be a plus for people sensitive to smells. This product is processed, however, so if you’re looking for the purest form of coconut oil, choose another from this list. This coconut oil from Sky Organics is a top-rated product that contains highly moisturizing, all-natural ingredients. Sky Organics coconut oil is USDA organic certified, kosher, cold-pressed, and unrefined. Impressively, Sky Organics coconut oil can be used as a color corrector. It’s good for color-treated hair and sensitive scalps thanks to its all-natural, gentle ingredients. The antifungal properties of coconut oil also is a plus for those who suffer from dandruff. It will alleviate a dry and irritated scalp. Overall impression: Many users rave about Sky Organics’ light, coconut scent that is not harsh on the nose but rather aromatic. The container is made of BPA-free plastic. Brand: Sky Organics is a brand you can rely on thanks to its small-batch production. It is never tested on animals and the coconuts always come from pesticide-free farms. The small, US-based company was founded by a mother in search of a good quality oil for a good price. Their coconuts are sourced from Vietnam. The return policy, however, could be better. You only have 7 days to return a product and you have to pay for shipping. Tips for using: When applying Sky Organics coconut oil, give your scalp a good 5-minute massage to relax pores and warm up the scalp for better absorption. This product is also great for sun protection as it acts as a protective shield against harmful UV rays. For an extra boost when making a hair mask, add 5 drops of lavender essential oil to 2 to 4 tablespoons of coconut oil. Massage into scalp and comb through to distribute evenly throughout hair. Wrap a towel around hair to help the oil penetrate and leave on anywhere from 30 minutes to 2 hours. If you’re looking for a pure, clean option, Sky Organics coconut oil checks all of the boxes. If you want a flexible return policy, however, Sky Organics may not be for you. Parachute is an extremely popular brand of coconut oil across the globe and especially in India and Bangladesh. This relatively inexpensive oil is 100% pure, containing no chemical additives or solvents to guarantee a clean, healthy product. It’s also non-hydrogenated and non-deodorized so it will not dry out hair. Parachute coconut oil is also unrefined and unbleached. Parachute is ideal for those suffering from dry or especially frizzy hair. The high quality of the oil makes it great for managing difficult hair textures. Overall impression: A lot of users particularly enjoy Parachute’s subtle and refreshing scent but there are some complaints of a strong smell. The only downside of Parachute’s oil is its packaging. The easy-to-squeeze plastic bottle is ideal when the oil is in liquid form, however, coconut oil is solid at any temperature below 76 degrees and is nearly impossible to squeeze of out the bottle. Liquid coconut oil for hair is easier to apply in this format. Once you get it out of the bottle, however, people love this oil’s soft feel and the fact that it doesn’t leave behind an oily residue. Brand: Parachute as a brand is known for pioneering the switch to selling oil in plastic containers instead of tin containers. The company is based in Mumbai, India, and is one of the country’s most trusted brands. Tips for using: To get the solidified oil out of the container, heat the oil by filling your bathroom sink with hot water and setting the bottle in the water for a couple of minutes. Parachute is a trusted brand worldwide. This unrefined, best-selling coconut oil offers maximum moisture for frizzy or textured hair. If you live in a cooler climate, however, heating the product to get it out of the squeeze bottle is time-consuming. We’ve highlighted the best, most natural and effective coconut oils on the market. Below, we’ve answered some of the most frequently asked questions about choosing the best coconut oil for you. Why Is Coconut Oil Good for My Hair? Natural, unrefined coconut oil is great for hair, skin, and even cooking because of its excellent combination of nourishing vitamins and fatty acids. Its unique ingredients help to detangle hair, make it grow faster and thicker, and protect and treat dry or damaged hair follicles. Organic: When looking into buying coconut oil, you probably want to choose organic. Organic signifies that the soil in which the coconuts were grown was not treated with pesticides. Unrefined: Refined simply refers to being processed, that is, refined coconut oil for hair has much of the coconut flavor taken out and chemicals added in. Unrefined coconut oil is made only from raw coconut meat. Give your hair the full benefits of the nourishing fatty acids and lauric acids with unrefined coconut oil. Cold-pressed: Cold-pressed coconut oil is raw and made from flakes of the coconut meat dried at low temperatures and retains all of the nutrients in the fresh coconut. Virgin: Unrefined, virgin coconut oil is made from the milk of the coconut and has not been refined. Non-virgin (it will just not say virgin on the label) oil has been made from copra, the dried coconut kernel and then refined. Regardless of what you’re using it for, you need to melt the coconut oil before applying it to hair. Coconut oil has a melting point of 76 degrees Fahrenheit, otherwise, it remains solid. This is fine for storing and even better for transporting, but not for usage. Warm up the oil by either rubbing it in your hands for a couple of seconds, or by placing the package in a small bowl of hot water. To use as a treatment, work the oil into your hair from root to tip. Hair can be dry or damp but it works best when hair is damp to truly penetrate into the hair shaft. After working in, gently comb through to evenly distribute in hair. Wrap a warm towel around hair to help it penetrate. Leave in hair for a minimum of 20 minutes. You can leave it in overnight and wash it out in the morning. To use coconut oil as a detangler, use a very small amount so as to not weigh hair down. The same process goes for using it to protect hair from the sun, pool, or sea. How Do You Store Coconut Oil? Feel free to store your coconut oil in your pantry or medicine cabinet. The key here is to keep it away from light so the product doesn’t break down. In the winter, it will become solid and in the summer will become more of a soupy liquid. How to Choose the Right Coconut Oil? Choose a coconut oil that is made specifically for hair, and is cold-pressed, unrefined (unprocessed), and organic. Don’t bother with anything too expensive, coconut oil does not have to break the bank in order to be effective and natural. Can I Use Coconut Oil as a Hot Oil Treatment? Coconut oil works wonders as a hot oil treatment. Heat causes expansion, and by heating up the oil, it can more easily penetrate the hair shaft and deliver intense hydration. How to Avoid That Greasy Feeling After Using Coconut Oil? Unless your hair type is very thick and textured, coconut oil will leave your hair feeling greasy and heavy. This is why it works as a treatment but not so much as an after-shower oil. To avoid that greasy and heavy feeling, be sure to wash your hair thoroughly after treatment with a good quality shampoo and conditioner. For a lighter feeling that still offers the benefits of this oil, look for a coconut oil hair cream or coconut oil shampoo. There are a lot of decisions to be made when it comes to choosing the right type and brand of coconut oil for your hair. Fortunately, all of the decision-making is worth it as coconut oil can truly work wonders for your hair. From sun protection to deep treatments, this natural product is better than nearly anything you can find at the drugstore or even the fanciest of salons.